If everyone is as stoked as this young woman, then the future of sailing is looking bright. being on the water daily is a reward in itself," says Brent, who has been a fulltime coach at St Francis YC for eight years. He grew up racing competitively and pleasure sailing in Monterey Bay. 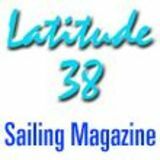 Lat 38: What do kids get from sailing nowadays? Paul Lang: "Kids still get the same things from sailing that I did when I first learned," says Paul Lang, Instructional Coordinator of San Diego’s Mission Bay Aquatic Center. "That is, feelings of freedom and independence and the joy of overcoming challenges. 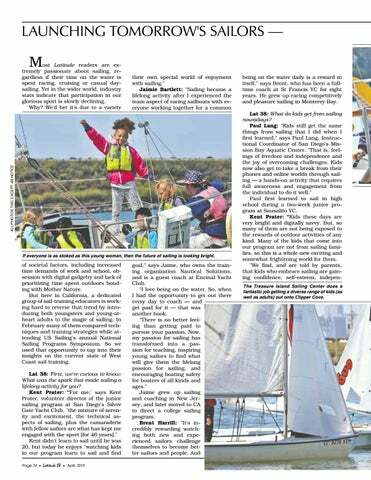 Kids now also get to take a break from their phones and online worlds through sailing — a hands-on activity that requires full awareness and engagement from the individual to do it well." Paul first learned to sail in high school during a two-week junior program at Sausalito YC. Kent Prater: "Kids these days are very bright and digitally savvy. But, so many of them are not being exposed to the rewards of outdoor activities of any kind. Many of the kids that come into our program are not from sailing families, so this is a whole new exciting and somewhat frightening world for them. "We find, and are told by parents, that kids who embrace sailing are gaining confidence, self-esteem, indepenThe Treasure Island Sailing Center does a fantastic job getting a diverse range of kids (as well as adults) out onto Clipper Cove.